It's 2017 and the end of January... where did the time go! The Common Ground Meeting Hall is a ticketed ($10) live music listening venue, bring your own booze and enjoy! 12737 Tamiami Trail, North Port, FL 34293. It is also broadcast on WKDW 97.5 FM and streamed on KDWRadio.com. The singing ladies (and me) at Freddy's Bar - fantastic party! My last update was November 30th 2016 - so there's a lot happened in the last two months... for one - it's a New Year and I wish you all a happy and healthy one. December took us to Scotland, from hot sunny Florida to the dreich, dark Dundee winter. I caught a cold immediately - it was very fashionable, everyone had one! First day back we went to see Dave Arcari, great Mississippi blues slide guitar and banjo fiend and friend from Glasgow - he had a show that day. It was great to see Dave in full swing and his wife Margaret (Dorothy's room mate in Dundee from 40 years ago !!) again. 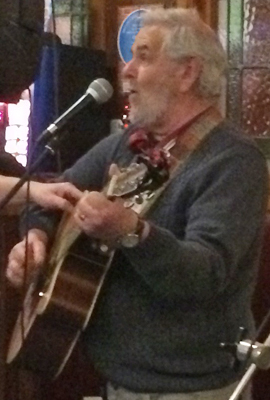 My gig in the Clep Bar, Dundee on our 1st weekend back, playing there with my pal Pat Ferrie was a great welcome. The Clep folks were their usual lively selves and we did our best to burn away any cold germs with copious amounts of Scottish antidote! I was also there for Big Tam's 60th birthday - a great night and greater hangover! PS... there were an abundance of kazoos for "Big Tam"
In Dundee I always like to play for the residents at Wellburn (where my mum ended her days) and Orchar (in Broughty Ferry where Dorothy & I first lived when we were wed). The folks just light up when they hear those old Scottish songs and become young again. It does your heart good. We left Scotland on Dec 30th and headed to our old stamping ground in the Netherlands, Ugchelen. When we were living there, we started a tradition of having a big musical Hogmanay (old year's night) party. Our friends Fred and Cecile have taken that to a whole new level and have a great event at Freddy's bar. The neighbourhood talent has grown (older (sorry) and better (you're welcome)) and this year we had some great singing from Dutch country star Antoinette Hommerson, Mandy, Maggie, Sandra and even Valerie! January 6th, I was booked in the Cafe Back in Town run by good friends Toon and Gon. We also made it an album release evening where I played popular songs and new songs from my album "Mullen it Over" It was a very good night. People were in a great mood and sang along with the songs old and new. I even got to sing my two Dutch songs - which went down a bomb. Then it was on the plane and back to Florida. I love Scotland, I love the Netherlands... but ohhhh I love the sun warming my skin in the middle of winter. It was great to be back in Florida - back for a heavy January of playing... the heat evaporated the drippy cold I had and I was raring to go again. 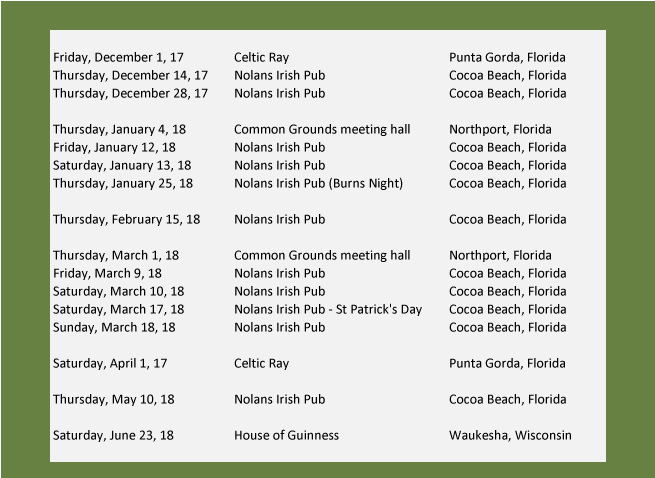 First weekend was in Nolans at Cocoa Beach. I played there last year at St Patrick's week - and it felt like I had never left. The crowd was as welcoming as I remembered and boy - they listen and enjoy their music. 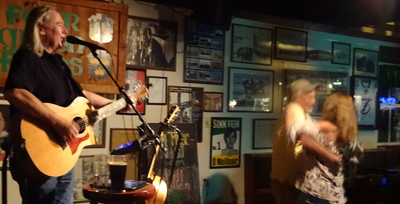 I played another show in Nolans on the Thursday, then we were off to Tampa, Florida to the Four Green Fields, a very popular old Irish pub with a gorgeous thatched roof. This was another place that loves its music and I'm pleased to say I got on well with "the Corner gang" they know (and sing) their Irish songs and were "giving it laldy"... I had a great weekend there and left with quite a few new friends. A great place, I hope to be back later in the year (when I return to Florida). Two years ago (maybe you remember), I played a Burns night in Nolans. We put the show together in just a few days and had a pretty good evening - we had a Florida haggis (cunningly disguised as a chocolate cake), poetry, song and a lot of fun. I was asked on St Patricks day last year by Al Denacoeur of the Celtic Norse Heritage Society if I would do a Burns night this year for them. I agreed as long as my travel plan brought me back on time. Well time marches on, my travel plan worked out and we upped the stakes this year big time. We had a real haggis, piped in by pipe major Ceallagh Donnachaidh, "the Immortal Memory" by Joe McColligan and a host of enthousiastic others reciting Burns, WB Yeates, Kipling and some funny authors. The three hours shot by with everyone in the place riveted by the spectacle unfolding before them and joining in enthusiastically when asked. It was a unique atmosphere for a very special evening. I have to admit, I was exhausted at the end - and happy it had gone so well. Danny Gibson. For those of you who have read my "about" page on my website, you will know that the Gibsons were our two-doors-down neighbours in Dundee. I loved their family parties at New Year and try to re-create that happy atmosphere with every show I play. I had lost touch with the Gibsons until a year ago when Danny's daughter read my website and got us in touch again. Danny played a rude song in the Clep for us (hahaha, it was a cracker) and I'm delighted to say, we didnae change, we just got a wee bit aulder. 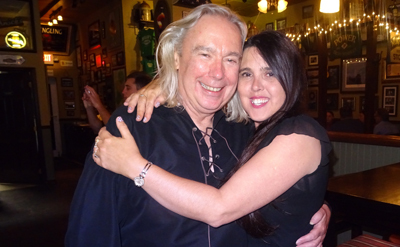 Joe McColligan and his wife Ching are lovely people. I met them in Nolans two years ago. Sometimes people tell me they are going to Scotland and ask for advice for their vacation. Joe and Ching did that.... except they weren't going on vacation - they went and lived in Aberdeen for almost two years and have experienced the winter bus-stop slush! I met them in Dundee last year and now they are back in Florida. When I asked Joe to do the "Immortal Memory" for Burns night - he didn't hesitate - he did it with a passion - and did a wonderful job of it! Gillian, from Bannockburn is great. She read "A Man's a Man For 'a That" at the Burns night. We met her on my first gig in Nolans two years ago (shouting abuse of course) and she is always a welcome face in the audience, her lovely wee family are crackers too - we had a Japanese lunch with her and hubby Glenn today - great folks! For the rest... I just have one more weekend in Nolans, then we're off to Wisconsin for our son Kyle's wedding to lovely Lauren. We then tour Florida (sightseeing) with my brother Doug and his wife Marjolein (stopping off to play a concert at North Port along the way). Then it's a westward dash and off to Honolulu for a variety of St Patrick's day festivities... that'll be great fun - we have a lot of friends out there that we are looking forward to seeing again. 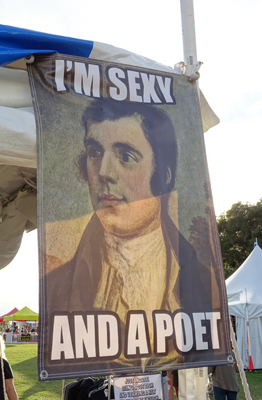 We got to enjoy the Central Florida Highland Games near Orlando one Sunday - it was huge, very well organised and some great acts including lads from Tannahill Weavers and the Men of Worth. Dorothy met a lovely curly-horned sheep which was walking a man and Claire and Jamie also put in an appearance!